You’re known for entering the animation industry from a very young age, so what was it that got you into animation in the first place? Believe it or not, I didn’t know anything about anime or the industry until I entered high school. I didn’t really watch anime as a young kid. It was in high school that I was actually exposed to it for the first time. At the time I wanted to do something like interior design and so entered a school known for that. It just so happened that the person that sat next to me was Satoshi Urushihara*. It was a meeting destined by fate. Yes, he really liked anime and showed me all kinds of stuff on his Betamax J9*. He carefully selected those episodes that were acclaimed by fans for their animation. Wow! (laughs). So it was a very special kind of tutoring. Among those, episode 2 of Invincible Steel Man Daitarn 3*, “Commander Neros’s Challenge”, really amazed me. That was when I first learned of Yoshinori Kanada’s* name. Being aware of the fact that, “so it’s this person who’s making the characters move in this way” may have really inspired me. I was more attracted to the animator’s drawings, or rather to the animation itself, rather than the story. So everything started because of the person who just happened to sit beside you. Katsushi Sakurabi* and Yoshitaka Kouno*, who would also go on to become anime directors, went to the same school as us. There were a lot of people in our grade who became animators. So with that being the stimulus, I started sending my original art to Studio Live in my second year of high school as well. I also did things like make appointments with Tatsunoko and Kaname Pro to meet and talk with the staff there. At the time there were a lot of “star animators” weren’t there? People like Kanada and Kazuhiro Ochi*. I really admired Ochi when he was young and at the height of his ability. Knowing that Ochi was not only doing key animation work but directing episodes and drawing storyboards when he was just 20 years old, I felt like I had to hurry too. I felt like that in this industry you’ve got to run to the top fast. So I thought that rather than taking it easy and going to school, I needed to get into a studio as soon as possible. I was sure it would be difficult but I didn’t hesitate or think twice about it at all. It’s really different from how people become animators these days, isn’t it? I’ve heard that a lot of people used to leave their home towns and go to Tokyo just for summer vacation to draw part-time at a studio. That’s right. I was one of that generation. Sleeping in youth hostels and theatres… (laughs). During that period people invited me to stay over and then it was nothing but practising drawing all the time. I calculated the minimum amount of days I had to attend to do the bare minimum to graduate from highschool, otherwise I was just drawing non stop. Were you drawing robots and mecha back then? No, at the time all I drew were people. *Satoshi Urushihara – Animator and character designer from Hiroshima. Known for Legend of Lemnear, Plastic Little and the Langrisser game series. *Betamax J9 – Sony’s Betamax SL-J9. Said to be the origin of the name of the J9 series. *Yoshinori Kanada – One of Japan’s top animators. A master of timing, angles, and perspective. His individual style reached many fans. Died 2009. *Katsushi Sakurabi – Animator, director, and producer known for Gun Parade March, Tsukihime and others. *Yoshitaka Kouno – Director and animator known for Magical Girl Pretty Sammy, Battle Spirits and others. *Kazuhiro Ochi – Director, animator, and producer known for Acrobunch, Campus Special Investigator Hikaruon and others. Most people think that animators enter the industry wanting to create works with the atmosphere and spirit of their favourite shows, but it’s a little different in your case isn’t it? I was actually more interested in opening animation. In an opening you can express everything with only just 30 cuts spread over 90 seconds as opposed to around 400 cuts in in a typical episode. When I was a student I wanted to create an opening for an international movie company (laughs). So you knew what you wanted to do from early on. Right. It all started with the Metal Armour Dragonar* opening. The first time many people became aware of your name was with Dancouga, after that it was the Metal Armour Dragonar OP that really impressed people. At the time of Dancouga, I was feeling really cramped by a lot of the restrictions for TV anime. Because of budget and schedule limitations I couldn’t shade as much as I wanted to and I was stressed out by the limited number of drawings I had to work with. Shortly after that I started working on Fight! Iczer 1* and for the OVA* format I was allowed to use as many drawings as I wanted. It was right after working on Iczer that worked on Dragonar. I was quite excited because I got the job offer for the opening due to the work I did on Iczer. I felt like it was our mission to create an opening using the technology we brought to life in the OVA. You channelled the frustration you were feeling from working on TV series into it. That and the other Sunrise robot anime OPs created by the senior animators around me had a really strong brand image, so I felt like I had to try something different. Kanada’s Daitarn 3 OP was one example, along with Kazuaki Moori and Tooru Yoshida’s Blue Comet SPT Layzner* OP, as well as Yasuomi Umetsu’s* Mobile Suit Zeta Gundam OP. These are names you think of as soon as you imagine an opening. Before any thoughts of winning or competing with these, working on the Dragonar OP seemed like the best tool just to grab attention. I also wanted to do something different from what had been done up until then. Lucky for me the producer at the time, Takayuki Yoshii*, left it all up to me (laughs). That opening had a pure image of coolness. I was expanding on the storyboards quite a bit during the key animation stage. However the opening’s director would revert it back to the way it was in the storyboards, so after my animation checks I would revert his changes back (laughs). The shot of the Dragonar rising up was originally meant to be in a tighter formation. You had a lot of ideas that didn’t make it to the final version. I was allowed to express my opinions on the shading and colouring as well. Even on the colouring of the explosions. I also wanted to draw the cockpit. Usually that would be treated as a background but I wanted to have a more active role. It was really nice how the panels shined together with the movements of the lever. I added a lot of details to the Dragonar cockpit similar to that of a F-15 cockpit. The conceptual designs weren’t completely finished when I started production. I didn’t have finished designs for the aircraft carrier and the lifter module for example, all I had were rough sketches. So the first opening that was entrusted to you was really rushed. I became an animator wanting to make openings like Kanada and even now I still want to perfect the openings I work on. If the opening’s good, you’ll be hooked to your TV screen for the next 30 minutes (laughs). I was aware of that when I did the Tekkaman Blade OP*. At the time I wanted to create my own Tekkaman as an homage to the original, so I made the OP barely even looking at the Tekkaman Blade reference materials. From the poses to the Voltekka attack, and if you zoom in, to the eyes and eyebrows as well; these are are all icons of the old Tekkaman. I think in the conceptual designs only one eye was mechanical, but instead I drew both eyes. It was funny to see Mr. Yamane* and the others who worked on the show get really riled up about it. Tekkaman Blade is still popular, isn’t it. Tekkaman Blade is often said to resemble Detonator Organ, and I was originally asked to make something like Organ. I tried to make it like Tekkaman instead and that’s how it ended up (laughs). *Invincible Steel Man Daitarn 3 – A robot anime produced by Sunrise. Broadcast in 1978. Directed by Yoshiyuki Tomino. *Metal Armour Dragonar – TV series produced by Sunrise in 1987. Proclaimed a “return to the basics”, amidst a war between the armies of the Earth and Moon, 3 young men pilot D-units known as Dragonars. *Fight! Iczer 1 – A 1985 OVA based on a short comic by Ren Arai. The organic & feminine form of the Iczer Robo were characteristic. *OVA – Short for Original Video Animation. Refers to a work made for direct release onto a home video format without plans for TV broadcast or theatrical release. Even now, with home video formats having mostly fallen out of use, similar works are still called OVAs. Works made only for laser disc called OLAs were also made. *Blue Comet SPT Layzer – A 1985 TV series produced by Sunrise. Directed by Ryosuke Takahashi. It was known for inserting highlight scenes from each week’s episode into the opening animation. *Yasuomi Umetsu – An animator and director. His works Kite and Mezzo Forte are famous not only in Japan, but abroad too. *Takayuki Yoshii – Advisor for Sunrise. He started working as a producer at the time of Metal Armour Dragonar. *Masahiro Yamane – An animator and mechanic designer. He was in charge of mechanical drawings for the Brave series together with Obari. He has handled mecha designs and animation direction for many other works. *Detonator Organ – An OVA produced in 1991 as an homage to 1975’s Space Knight Tekkaman. Like you mentioned earlier, at that time anime fans could learn what animator had worked on something from a magazine, and then seek that animator out. You received more attention after finishing the Dragonar opening, but did you learn your excellent timing and movements from earlier anime? Not exactly like that. One’s own personal sense always plays a role, but I was also influenced by kabuki, pro wrestling, and other things. That’s definitely the case with the power ups. The first time I drew Dancouga on 1s was on the “Dancouga: Requiem for the Victims OVA”, the scene where it throws the sword. That was really interesting. The way it was filled out was amazing, like the way the movement is suspended in one sinking tempo when its legs reach the ground. You couldn’t do that kind of thing on TV. Unlike how DVD/BDs are sold today, at the time no one thought the video formats would last, so we were free to experiment with a lot of things. Even so I thought Dancouga was quite a magnificent show. The shading and forms were really artistic. We tried to take the middle road between super robot and real robot. However Sunrise was doing Layzner at the same time and we were really jealous of all the drawing counts they could use over there. On our end even when we’ve added nice shading to our drawings, it ended up getting simplified. Director Okuda* is still doing really well, but he has rather set ideas, and doesn’t compromise. He’d say things like “It’s TV anime, so you can’t overdo it”. Like if you tried to add an extra cut in, the balance with the other cuts would get ruined since they’d have to be removed. Even among those restrictions, your uniqueness came out in the use of perspective. I’m not so sure… I was only 18 at the time (laughs). It seems like your way of showing robots in a cool way had already been fully developed. You weren’t necessarily told to draw in a certain way, were you? I was allowed to do as I pleased by the director. Originally there was no design for Dancouga’s sword, so I drew it myself and asked “is this okay?” That was how we worked on Dancouga back then. I was even told by Mr. Murakami “I was surprised to see Dancouga with a sword!”. It was amazing to see Dancouga move on TV. The way it seemed both hard and bodily was amazing. All the while having a limited number of drawings to work with. This was also the case for Black Wing’s transformation scene that Black Knight Aran rides on, but I got to draw the design for the Black Knight a lot. I drew the animation for his final scene. He’s a good character. It was really nostalgic to see him resurrected in the Super Robot Wars video games. Among the still shots there’s a scene that looks like it was drawn with a brush. Was that your idea? It was a highlight brush. I drew that after consulting with the special effects designer as to where to insert the scene. For that kind of scene you draw shadows on the surface, and then it’s easy to brush over. It’s hard to use the brush when shadows are incorporated into the design, so I drew the boundary line and he finished it. Were you also in charge of the colouring? Yes. I always worked thinking about how all the colours would come together. Shading is also important when drawing robots, isn’t it? A robot’s expression changes based on the shading. For a Brave-style robot wearing a mask, the boundary between a shadow and a highlight can be the line between good and evil. That’s something you have to be careful about. There are a lot of still shots in Dancouga, but when it moves it looks great. Even as a combining robot, it’s not only combined from multiple parts, but, for example, when it grips with the hand you can see the tension in the upper arm. When did you start incorporating those kinds of elements? I started incorporating that kind of thing around the time of Dangaioh*. *Seiji Okuda – Anime director and producer known for Dancouga, Yokoyama Mitsuteru Sangokushi and others. He has produced storyboards for countless works. *Katsushi Murakami – Legendary designer of anime and tokusatsu. A godlike figure. *Dangaioh Hyper Combat Unit- A 1987 OVA. Featuring transforming robots, it’s full of homages to 1970s robot anime. The main theme was sung by Ichiro Mizugi and Mitsuko Horie. So you got the idea for that kind of powering up action from kabuki and pro-wrestling? I used to do kendo so I think it partly comes from there as well. I was also influenced by the ways performers sense where the camera is and perform to it. The camera itself shakes a lot as well. When there’s too much movement to track and the camera would end up shaking, like Falgen’s scene from the Dragonar OP, I calculated the gradation and moved the camera accordingly. That sense of movement or rather chasing the object with the camera was, I think, new to anime at that time. I see. You grab attention with just an instant’s cut. That was when home video was just started to spread, so I closely studied your action scenes in slow motion. I often use 6 frame or 8 frame cuts. I once tried inserting a 6 framed cut into a movie as well, but sound director told me off. He told me it’s so short that he can’t insert sound and that it blends into the next cut (laughs). When there are those short cuts amidst the main flow, there’s a feeling of compactness and polish. Even if you can’t quite see it, it leaves an impression. If they’re not included in the storyboards, does that mean you’re free to insert them where you like? That’s right. Of course there were times where I couldn’t do it exactly as I wanted so I often felt torn. When I am drawing animation I also draw with the eye of a director, so when there was something in the storyboard where I wondered “why is it like this?” I would think “this is how it should be!” and would change it myself. The first episode of the Dangaioh OVA was the first time I drew the storyboards myself, around about 120 cuts. From the combination sequences to the end of the fight. I also drew all the key animation myself, so it was the first time I really had the freedom to work as I please. When Dangaioh transforms, there’s a sequence where a unit suddenly rushes in from behind the camera. The same effect is used in the 3rd Mobile Suit Gundam AGE OP*, it really has quite an impact. This effect also consistently appears in the Brave series and elsewhere. The staff who work on those anime sometimes ask me for permission to use that effect (laughs). It’s like your copyright (laughs). The three-dimensionality and sense of space that effect achieves is incredible. I aimed for an incomplete kind of coolness with the transformation sequences in Dangaioh. Despite the arms and legs connecting, its still in a soulless state where it can’t do anything. Then when it moves, we wanted to establish a quickly moving pace and expression of space. When Dangaioh uses the attack “Psychic Slash” it looks like giant Space Sheriff (Ed:Probably referring to Gavan). I was actually listening to the soundtrack to get myself really pumped when I was animating that scene. I’ve always loved the music that Mr. Chuumei Watanabe creates, but the pieces he made to fit the storyboards are just too good. Dangaioh is doing some really interesting things from a mecha directorial standpoint, like the rising and falling rocket punch. There weren’t many mecha that had battles in the streets. I originally had a lot more detail when I was drawing the layouts. Like when overlooking the street crossings there were phone booths, and overall there was just a lot more detail, but in the end it got cut by the background department. The scene where Dangaioh draws out the sword as well totally differs from the original scenario and was mostly improvised by myself. You improvise at the storyboard stage? Director Toshihiro Hirano* told me: “show me what you can do from the combination sequence to the end with 120 cuts”. It wasn’t easy. It ended up being well received, and it lead me to the opportunity of being a director (Ed: Bubblegum Crisis). At 22, I thought I was the youngest director in the industry, but actually Pop Chaser’s* Mr. Kitakubo* was younger (laughs). OVA’s were generally quite experimental at the time and a lot of directing was left up to young people. *Mobile Suit Gundam AGE – A 2011 Sunrise production. An ambitious series that incorporated Akihiro Hino into its production.. In addition to directing, drawing storyboards and doing KA for the 3nd OP, Obari also participated in 2nd and 4th OPs as an animator. *Toshihiro Hirano – Animator, director, and character designer known for the TV series Vampire Princess Miyu, the OVA Megazone 23, Dangaioh Hyper Combat Unit and others. *Pop Chaser – An adult OVA in the Cream Lemon series. The creator, director, and character designer Dai Sakura is in fact Hiroyuki Kitakubo. *Hiroyuki Kitakubo – An animator and director known for the OVA Black Magic M-66, the Jojo’s Bizarre Adventure OVA produced in 1993 and others. I feel a real sense of craftsmanship in the movement in your works. Even in the art for video packaging and magazines, there’s a strong feeling of activity. I assume that the whole process for drawing still images and creating movement in animation completely differs, but what do you think? Whether I’m trying to make conceptual art look good, drawing for a magazine or anything else, I draw to suit it’s use. For example if I’m drawing for a magazine I keep in mind where the title will fit, what will stand out, where the eye will be drawn to and so forth. That’s just applying the features of a human’s skeleton and muscle structure to robots. Like thick thigh and arm muscles. Like it’s a robot but it’s not just a machine. It became the industry standard. It’s like you established a new orthodox way to draw robots. Though from the Brave series onwards you started to draw with straighter lines. Even now I’m allowed to draw illustrations the way I please, but sometimes it’s just easier to use ruled lines. Why did you go from drawing freehand to using ruled lines? Because other people can’t imitate it when I draw freehand. When I’m working on something alone it’s fine, but it becomes an issue for the production if the movements and forms aren’t the same. That came up following Dragonar, when I was told that no one could recreate the images from the opening. So there really was that kind of thing. That’s right. Like “we can use it as a reference but we can’t recreate it”. When I directed, storyboarded, and did the animation direction for the Tekkaman Blade OP, I was told that “We’d like to emulate the opening but it’s just not possible”. Around that time when I started working on Brave Exkaiser I thought that, if the reviews were good and I could carry on working over to the next production, then in a year’s time I could come up with a drawing style that other people could emulate and one that could be mass produced. Do the inbetween animators also use rulers as well? It’s the case for inbetweeners as well. As I moved from Dangaioh and Dragonar to the newer style on the Brave series, others became able to draw in the same way as me. So it’s thanks to the rulers. Judging from the movements and powerups in Gravion, it seems like the Obari style was spread to the whole studio. If everyone could do that we can keep a distinct style. I became the main animator on Brave Fighter of Sun Fighbird, so I had to unify the studio. After Exkaiser was well received. I was able to direct my own anime but due to a lack of flexibility it wasn’t quite possible on that anime. However following that I worked really hard on the Brave Express Might Gaine OP. For the Brave Fighter of Legend Da-Garn OP, I wanted to change it up and produce a more nostalgic work. I changed the feel and wanted to make something inspired by Kanada instead. You change your production techniques for every work. Every time we try to experiment without deviating too much. I think your way of highlighting robots was also original. Does that have any relation to movement? You highlight to indicate direction. My cut in the 2nd Gundam AGE opening is one example of this, but it’s like how effect lines express speed in manga. I call them “Lightning Highlights”. It seems like they’ve become bit of a fad recently (laughs). Speaking of Gundam, it’s said that Mitsuo Fukuda asked you to work on the Gundam Seed OP but you couldn’t work on it, so he ended up mimicking your style instead. If that’s true it’s a real honour. For that reason, it may have been easy to work on the Gundam AGE OP. I was told to do the timing like I always do. So those were the orders. When you draw storyboards, what kind of thing do you pay attention to? Of course it’s important to approximate the final product. When it’s a rough storyboard, there’s too much room for error. The sponsor, director and producer all see it so you have to make it something everyone can cooperate on. Is it also possible to leave room for the key animator’s interpretation? If it were live action you could do something like that, bur for anime it feels like abdicating one’s job. You have to make a clear blueprint. When I worked on Iczer 1, Mr. Hirano said to me “70% of anime is in the storyboards, so do a good job” and I believe those words influenced me. Even for the same script, the rhythm and tempo could be completely different if a different person did the storyboards. I recently did all the storyboards for the last episode of Hakuoki, and it was really a learning experience. I thought if someone else did the storyboards it would have ended up completely different. Even with Hakuoki as soon as you see the OP, you can immediately tell who made it. I want to express my style outside of mecha as well. I like mecha, but I also like characters. *S-Stance – A Japanese term for a way of standing with the chest and pelvis thrust forward. *Choujuushin Gravion – 2002 Gonzo TV series. The mysterious and wealthy Sandman leads the “Earth Gartz” to fight against the mysterious alien invaders known as “Zeravire”. *Brave Fighter of Sun Fighbird – 1991 Sunrise TV series, 2nd in Brave series. Depicts the fights between energy beings of good and evil. When he jumps inside emergency rescue vehicles, Fighbird transforms into a giant robot. The mecha you draw have a sense of character. Are their styles and poses based on those of humans? That’s right. I learned to draw by studying human bone structure and that influences my work. Almost as if there were an actor hiding inside a suit. It’s the same for characters. For example in the King of Fighters OVA I drew Terry Bogard* much the same way. You originally wanted to bring images to life, the way you do it is by applying human structure to robots. For movement, yes. But for robots, it’s all about the face. Whilst working on Dancouga I was told by Mr. Katsushi Murakami “draw a beautiful face”. He’s one of my mentors when it comes to design. When he told me my robots faces were good, I was really happy. He also liked how I changed the robot’s face depending on who was piloting it. So from that time onwards robots were like characters to you. Regarding my drawings Mr. Murakami would only comment either “This looks bad”, or “All okay, looking good”. He was a mentor who would let you know when something wasn’t good. This pleased me as a fan and it was also good for my work. By the way Dancouga Nova’s design was a collaborative effort, so when I drew the head and other parts for the humaroid mode, I just tried to draw exactly as Mr. Murakami would. That was really fun. You often add details to robots that weren’t a part of the original concept. How did you start doing that? The schedule for Dancouga was really hectic and I didn’t have any time to make my drawings move. In exchange for that, I at least wanted to add as much detail as possible to my still images. I expanded on the original designs by drawing in things like round openings and extra hatches. Like Leiji Matsumoto’s “meter” or Yutaka Izubichi’s “round holes” each mecha designer has their own secret techniques. I think mine is adding a honeycomb patterned hatch on the side. I used that on the Brave series quite often. You often add apparatus or the inner mechanical workings to your drawings. What inspired that? I often get ideas when I’m taking a trip or am in the bath. I get inspired by things I experienced in the past. However I think I’ve only expressed about 30% of my ideas. I’ve thought of more interesting things, but haven’t been able to express them in my drawings. The problem is thinking of how to give concrete form to these ideas. I’d like to express originality and individuality after all. There is originality in the spirit of that idea itself. I don’t want to imitate people. More so than mecha, I like robots, especially super robots. I draw characters too, but I robots to be the most enjoyable. You can express them in a really extravagant way when you animate them. *Brave Fighter of Legend Da-Garn – 1992 Sunrise TV series, the 3rd in the Brave series. 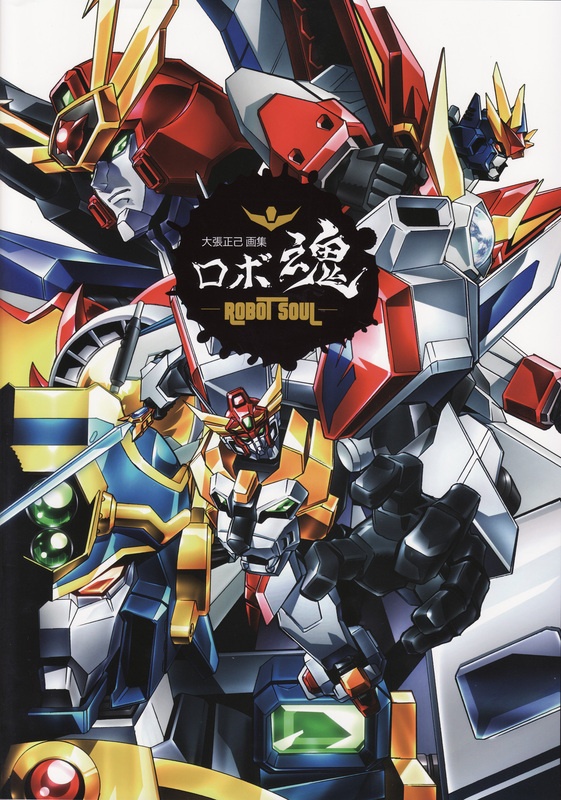 Seiji Takasugi becomes the captain of a team of 8 Braves robots and fights against invaders known as “Redron”. *Terry Bogard – The main character of SNK’s “Fatal Fury” video game. Obari drew Terry as the lead character in the Fatal Fury anime adaptations (Working as character designer and later director). I think your way of drawing mecha is an invention that will go down in the history of anime. Drawing robots that, if drawn according to concept would be just normal, but you draw them in an intensely detailed way. I feel like that’s really at its peak in the Brave series. When we made the Brave series, we didn’t expect it to be well received like it is now. Looking back now, the 90s was the Brave era. Toy makers also are making more and more of the robots from that era into products, expressing the flavour of that era. It seems like the three-dimensional world has finally caught up to you. How does it feel to see your works made into three-dimensional products? I can hardly express how happy I am. I was also really touched when Compatible Kaizer* was turned into a plastic model. I’ve observed it so many times, but when I finally saw the parts attached to the runner, I thought “Hurray!”. I also love Chogokin line of toys, so I was really moved that they made toys related to things I’ve worked on. Strictly speaking they’re not my designs; I just re-designed them. However it would be amazing if something I designed 100% was made into a Chogokin toy. It’d be a dream come true. You have a lot of followers in the field of models and toys, but I think you have even more followers in the world of animation. Of course I’m really happy to be respected. I’d also like more and more people to be able to draw robots. That’s why I’d like more anime to put an effort into having 2D drawn robots. So that’s why I stubbornly used 2D robots in the SRW anime adaptation. It seems like some people are unsatisfied with 3DCG robots. No doubt 2D drawn robots are great. But of course, it takes a lot more work to animate mecha using 2D methods. With that in mind and how CG can easily be mass produced, that seems to be the trend. It seems hard to train new animators to draw robots in 2D. In the past, anime were often sponsored by toy makers and robots would definitely appear in those show. That’s not the case these days. There are still many shows like that aimed at children but many of them are employ 3DCG. Only your robot was 2D despite the rest of the show using 3DCG (laughs). However if an artist who is a master of 2D tries 3DCG, the results may differ. I have a plan for what I would do, considering I’ll probably have to do it at some point. Mr. Yamane himself drew the key animation for Kimeraiger’s debut scene, there I appreciated the importance of 2D animation once again. I want to do something similar in one of my next projects. Often in your animation, one really feels a sense of gravity and weight when something hits the ground. The camera shaking helps, but it seems that kind of effect can’t be fully recreated in 3DCG, or at least isn’t as developed. I think it would be different if animators worked together with the 3DCG operators. If it were me, I would do everything up to the combination in 3DCG and then combination sequence as a hybrid of 2D and 3DCG. Then follow that up with 2D. Something along that approach. In the Super Robot Wars OG anime, the grunt Lion units and the battleships were made in 3DCG, but the main robots were done thoroughly in 2D. That feels like a step forward to me. The SRX* had way too many lines to draw, so we did it as a hybrid of 2D and 3DCG. The core robots were 2D while the extra parts were 3DCG. We made 2D and 3D coexist in that way. It seems like you’re already experimenting with 3DCG quite a bit. I’ve experimented and have some results, so now I’d like to incorporate some of it into one of my next projects. When making something I’d like to discuss with everyone which cuts should be 2D and which should use 3DCG, I want to be able to use 3DCG as just one of many resources. So I think it would be interesting to use 2D up to a certain point and then seamlessly change to 3DCG from there onwards. You pick out and emphasise a particular scene’s quality. In the Super Robot Wars OG anime, during the combination sequences we used a perspective effect on the models. The director of the CG team made an “Obari proportion” model for SRX with slanted eyes (laughs). The one that appears in the second half of the series is this version with the perspective effect. We really experimented with a lot of different things. *Compatible Kaizer – A robot with an original design appearing in the Super Robot Wars series. *Chousoku Henkei Gyrozetter – An anime series broadcast from 2012. A battle anime featuring vehicles transforming into robots, many real life automobiles also appear. *SRX – A robot with an original design appearing in Super Robot Wars series. It’s both a super robot as well as a real robot. The Industry Wants Robot Artists! What advice do you have for people who want to draw mecha? Draw the way you like. There’s no set method, so you have to believe in your own methods. If you don’t then nothing new will ever be made. You can’t just imitate others. It’s true that I may have a lot of followers, but I want others to step off that path and do something new. The so-called “Brave Proportions” I developed in my early twenties has been imitated ever since. I really think it’s time for something new. I’d like to see it done in 2D rather than 3DCG as well. You said before you’re interested in trying many things, including 3DCG. Do you think 3DCG will be able to overcome the limitations of 2D? It’s hard to stand out using 3DCG. You can’t show the kind of individuality that would immediately tie something to a studio or an artist. The form and effects can easily be copied and soon everyone’s doing the same thing. So it’s important to draw by hand to develop one’s individuality? That’s right. I want to see a genius to appear out of the younger generation. The developers of Super Robot Wars are working really hard and I think something good will come from the animators and creators there. While I was working on Compatible Kaiser for the video games I saw some of the work being done in the development department and there are some incredible people there. Their way of drawing, the form of their effects and timing of their animation is incredibly minute. I really feel like something is happening in that sector. I really want them to do things like openings or battle scenes. I’m on good terms with Super Robot Wars development team, and we influence each other in a good way. The 2nd Super Robot Wars OG* game also had some cut-ins influenced by the anime version. So a worthy creator may come from there. You yourself were 18 when you worked on Dancouga. Today there isn’t much of the feeling “we can use this guy, so let’s take him” that there was back then right? That may be true. Though if I met someone like my old self, I’d definitely use him (laughs). You have a career lasting over 30 years, but it seems like you never had any second guesses or missteps. All your works from the beginning to now seem like one continuous relay. Not only did I work on mecha but on characters as well. I have directing experience as well, so I think the secret is that I enjoyed developing and expanding my own skills. Is there something you’ve yet to do as an animator that you still want to try? It was interesting working on Hakuoki, so I’d like to to more period pieces, especially about the Bakumatsu. The basis for period pieces is old, but the production techniques are cutting edge. For that reason it seems like a period piece made by you would be really interesting. There are a lot of similarities with robot anime. I like the Shinsengumi so I especially enjoyed Hakuoki. New shows from new genres are of course great. However I’d also want to keep seeing shows that come on every week with robots like yours. I feel like robot culture would suffer without them. I do design as well but I’m really more of an animator than a designer. So what’s really important is whether or not I can make a design move. The same design can become completely different in the hands of a different animator. That’s the unique draw of robot animation. Even now I’d like to carry on perfecting, moving forward and evolving my own animation style. I’d like to thank everyone who had a look at my artbook! * 2nd Super Robot Wars OG – The 2nd game where all the original mecha and characters from the SRW franchise come together. Being the first SRW game for the PS3, the battle animations are better than before. Well there you go, that’s the entire interview. I hope you enjoyed it and learnt something new about Obari. I know I did! If you have any question or comments feel free to leave a message! This entry was posted in Animators. Bookmark the permalink. Can you ad the other interview that was on the G-One Super Design Works? It’s next on my list to do! I had that book in the late 90s! I bought few months ago a Tobikage fanzine of the ep 41. This packed with Ohbari’s original drawings (key frames). They are also full of the illustrations with Ohbari re-designs!!. I think I know which fanzine you are talking about. I wanted to buy it off Yahoo auction, but it was quite expensive haha! Watch this. An illustration of Shinya Oohira of the time in which his style was similar to Ohbari. It was a very short period (in Studio Break or above). On the other hand a few months ago I discovered some of the first animations made ​​by Hideki Tamura (In episodes Dougram and Golion) and I very surprised to recognize the obvious inspiration of Masahito Yamashita (even working in the NeoMedia Pro and after in Studio MIN with Hiroyuki Kitakubo and others). Not if you know Hideki Tamura (characters of Fandora, Madox-01 and Le-Dius). Tamura will be the boss and first influence in Michitaka Kikuchi (Kia Asamiya) when both worked at Studio CAM. I really like the designs of Hideki Tamura an Michitaka Kikuchi. I am a follower of both illustrators / animators. You can see some works of Tamura in my blog. Wow thanks for that image! It looks very much like Yamashita! By the way, what is the link to your blog? I lost the link to it a while ago. Yes, I know the animation of opening the pachinko Combattler. Tamura still retains some old traces in their characters and animation style did not change much. We are evaluating whether to continue with the activity on the blog. We wanted to write some more descriptions artbook, since we have a lot of material without showing. It features Shinya Ohira(! ), Nobuyoshi Habara, Shin Matsuo, Chiharu Sato, Atsushi Yano and Hideki Tamura! Never reblogged before but I just love this interview & anted to share it! Enjoy! Pingback: Fans Rejoice as CharaExpo 2015 unveils its exciting Line-Up! Hello Kraker! Look at my last post on my blog. The first part of the storyboards of the Tekkaman blade openings!! Hello kraker. I have received things from Japan. You can see some pictures in my blog. I have the Ohbari doujinshi containing the stoyboard of the second opening of Tekkaman Blade! On the other hand, I also bought another Ashi doujinshi from 1984. This section also contains words of them! And it includes a small mini illustration. One of each. Then I am sending you this illustration via email.